Do you want to learn how to make your club’s activities more inclusive? This workshop is predominantly being run for the Gymnastics staff and personnel from Moyhu and Wangaratta YMCA clubs, but any other interested individuals or sports in the local area are welcome to attend as well. Much of the information is transferable across all sports. 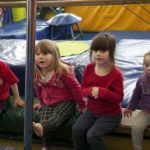 Gymnastics Victoria’s 2 hour Inclusion Awareness workshop is ideal for upskilling coaches, administrators and club personnel in supporting people with a disability to participate in Gymnastics and other sport and recreation opportunities. This workshop also explores the inclusion of other underrepresented groups in the community, including CALD communities, indigenous Australians and older adults. This interactive workshops explores discrimination, the skills and qualities of an inclusive coach, communicating with people with disabilities and modifying gymnastics activities so that everyone can participate and enjoy a positive experience in sport. 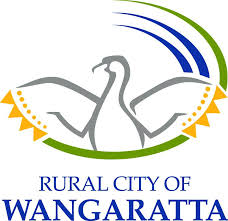 Following the successful Wangaratta Sport Forum held in June, this workshop is about Inclusion and Diversity in Sporting Clubs. Facilitated by founder of ‘Advancing Women’, Michelle Redfern, the workshop aims to provide an opportunity to gain a better understanding of what your club can do to become more inclusive. Michelle is a passionate advisor who is determined to contribute to achieving global gender equality in her life time, with particular emphasis on the sporting sector. Michelle currently holds board roles with Williamstown VFL Football Club and Good Shepherd Microfinance. WHERE: HP Multipurpose Centre, Schilling Drive Wangaratta (between the Rovers Football Ground and the Hardcourt Tennis Club). Light refreshments will be provided. Places are limited so please book early. You can book your place today by clicking here. 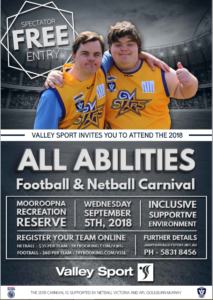 Valley Sport have partnered with Netball Victoria and AFL Goulburn Murray to host the All Abilities Football and Netball Carnival on Wednesday 5th September 2018. The carnival will be held at the Mooroopna Recreation Reserve, Joyce Reid Drive, Mooroopna, Victoria, beginning at 10am. Players from the North East Victoria region are encouraged to enter a team for this inclusive event. It is sure to be a great day where you can be active, showcase your sporting talents with your friends and make new friends too.